Duct Cover film is an easy to use adhesive film designed to keep air ducts clean prior to and during construction. The 3 mil, polyethylene surface protection film is guaranteed not to leave a residue on duct work. Roll size 24" wide x 200 ft. long, 400 sq. ft. 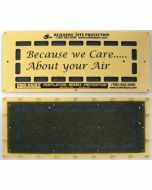 Your customers will appreciate your efforts at providing them with clean air! Whether you're an HVAC contractor or a custom builder or remodeler, Duct Protection can keep your ducts clean. Apply to the interior of your ducts to prevent drywall dust and mud. 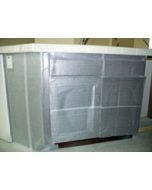 This easy to use duct cover film won't leave a residue and can be easily cut to accomodate many duct sizes. We also carry Pro Vent duct protection for additional vent protection needs.